The Founders of the United States were influenced by ancient political systems and learning. The extent remains a matter of debate among historians. Historians see in the American Founding elements of “modern” influences or “classical” influences – or a combination of the two. Read each extract, keeping in mind how each historian poses the relationship between the antique and modern. Distinguish differing points of view and points of convergence. Compare and contrast the four historians’ views of the impact of the classics on the Founders’ constitutional outlook and their political thinking. Early Americans lived in the afterglow of the Renaissance. Despite the distance from the great centers of humanistic learning, the absence of visible relics of the Greek and Roman presence to memorialize the continuity with Classical antiquity and excite feelings of pride in the cultural heritage, sporadic opposition on religious and utilitarian grounds, Classical learning was swiftly naturalized on American soil, and in consequence a fair number of colonial and revolutionary Americans was nurtured and moulded by the humanistic tradition. Though, as on the other side of the Atlantic, the immediate beneficiaries of this learning constituted a small intellectual elite, the markedly higher level of literacy in America provided a wider audience for the Classics. Nevertheless, the overriding needs imposed on Americans by the winning and developing of a new country on the edge of the wilderness, the priorities obtruding in the practical and political domains affected Americans differently than was the experience of their Classically educated counterparts in Europe. Americans did not, for instance, produce a single great Classical scholar in two hundred years; they did not make a single significant contribution to Classical scholarship. But while adding nothing to the fund of Classical learning, they plundered the Classics liberally for the advantage of their own lives and the national good. For many Americans, there is no doubt, Classical learning was a superficial veneer, the indispensable hallmark of “gentlemen’s culture;” yet many of them drew inspiration throughout their lives from the study and reading of the Classics. They knew far less about the ancient world than we do today, but the learning they acquired, circumscribed though it was, affected their thought and action far more. Their reading in and meditation upon the Classics was eminently practical and purposeful; and it contributed substantially to the development and motivation of an unparalleled concentration of political giants in world history. Evidence abounds for an American cult of antiquity during the eighteenth century, particularly during the second half: the ubiquitous classical quotations and tags; the common use of Classical pseudonyms; the revival of Classical place names; the constant adducing of Classical parallels; even the frequent use of Classical names for slaves in the southern states. Overshadowing all these was the tireless and purposeful reading by early Americans of the Classics as a repository of timeless models for guidance in republicanism and private and civic virtue. “The Cult of Antiquity,” Classica Americana, Wayne State, 1984, pp. 23-49. But this elaborate display of classical authors is deceptive. Often the learning behind it was superficial; often the citations appear to have been dragged in as “window dressing with which to ornament a page or a speech and to increase the weight of argument,” for classical quotation, as Dr. Johnson said, was “the parole of literary men all over the world.” … What is basically important in the Americans’ reading of the ancients is the high selectivity of their real interests and the limitation of the range of their effective knowledge. For though the colonists drew their citations from all portions of the literature of the ancient world, their detailed knowledge and engaged interest covered only one era and one small group of writers. What gripped their minds, what they knew in detail, and what formed their view of the whole of the ancient world was the political history of Rome from the conquests in the east and the civil wars in the early first century B.C. to the establishment of the empire on the ruins of the republic at the end of the second century A.D. For their knowledge of this period they had at hand, and needed only, Plutarch, Livy, and above all Cicero, Sallust, and Tacitus – writers who had lived either when the republic was being fundamentally challenged or when its greatest days were already past and its moral and political virtues decayed. They had hated and feared the trends of their own time, and in their writing had contrasted the present with a better past, which they endowed with qualities absent from their own, corrupt era. The earlier age had been full of virtue: simplicity, patriotism, integrity, a love of justice and of liberty; the present was venal, cynical, and oppressive. The Ideological Origins of the American Revolution, Harvard, 1967, pp. 24-26. For Americans the mid-eighteenth century was truly a Neoclassical age—the high point of their classical period. At one time or another almost every Whig patriot took or was given the name of an ancient republican hero, and classical references and allusions run through much of the colonists’ writings, both public and private. It was a rare newspaper essayist who did nor use a Greek or Latin phrase to enhance an argument or embellish a point and who did not employ a classical signature. John Dickinson lived up to his reputation for “Attic eloquence and Roman spirit” by ending each of his Farmer’s Letterswith an appropriate classical quotation. Such classicism was not only a scholarly ornament of educated Americans; it helped to shape their values and their ideals of behavior. “The Choice of Hercules, as engraved by Gribeline in some Editions of Lord Shaftsburys Works,” which John Adams proposed to the Continental Congress as a seal commemorating the British evacuation of Boston, was a commonplace of the age. Man was pictured in classical terms struggling between the forces of virtue and vice, reason and passion. Rural life was celebrated not for its wild or natural beauty but for its simplicity and repose to which in Horatian fashion virtuous men could retire after a lifetime of devotion to duty and country. The traits of character most praised were the classical ones—restraint, temperance, fortitude, dignity, and independence. 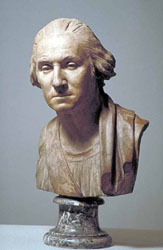 Washington seemed to his contemporaries to fit the ideal perfectly. The Creation of the American Republic, 1776-1787, North Carolina, 1969, pp. 49-50. While the founders used classical symbols to create implicit analogies, identifying themselves and their causes with the ancients, they also formulated explicit analogies and contrasts between ancient and contemporary individuals, societies, and governments. Decades after some of the founders lost their facility with the classical languages, they retained a thorough knowledge of ancient history. Ancient history provided the founders with important, if imprecise, models of personal behavior, social practice, and government form. Such models gave the founders a sense of identity and purpose during the struggles of the Revolutionary and Constitutional periods. The founders’ models of personal behavior included mythological figures, Athenians, and Romans. The founders met their mythological heroes in the works of Homer, Hesiod, Virgil, and Ovid. They found their Athenian heroes in Herodotus, Thucydides, Xenophon, and especially Plutarch. The Founders and the Classics, Harvard, 1994, pp. 53-54. Although he admired Plutarch, Alexander Hamilton thought classical antiquity, especially Rome, offered the new United States few exempla. He said: “Neither the manners nor the genius of Rome are suited to the republic or to the age we live in. All her maxims and habits were military; her government was constituted for war. Ours is unfit for it; and our situation still less than our Constitution, invites us to emulate the conduct of Home, or to attempt a display of unprofitable heroism.” What did Hamilton mean by this, and what realities of the United States (especially in regard to Great Britain and France) in the 1790s led Hamilton to draw this conclusion? What elements in Hamilton’s early life would reinforce this point of view? In Chapter 4 of The Founders and the Classics, Carl J. Richard raises the concept of classical anti-models: “those ancient individuals, societies, and government forms whose vices they wished to avoid.” What political qualities were the Founders eager to avoid? Why were Sulla, Cataline, Nero, Caligula, and Julius Caesar “anti-models” for early American leaders and the Founders. Why did Andrew Jackson’s enemies call him an American Caesar? In The Learning of Liberty: The Educational Ideas of the American Founders, Kansas, 1993, Lorraine Smith Pangle and Thomas L. Pangle admirably survey the role of the classics and the civic curriculum in eighteenth- and nineteenth-century American education. The word Athenaeum is derived from Athena, the goddess of Knowledge and Wisdom. In The Mirror of Antiquity: American Women and the Classical Tradition, 1750-1900, Cornell, 2007, Caroline Winterer observes that the iconic American figures of Liberty and Columbia are classical in origin. In what ways? Explore the allegorical figure of Athena (known to Romans as Minerva) and her symbol of the Owl, and investigate how Americans used each as signifier of Knowledge and Wisdom in literature, public monuments, and rhetoric.